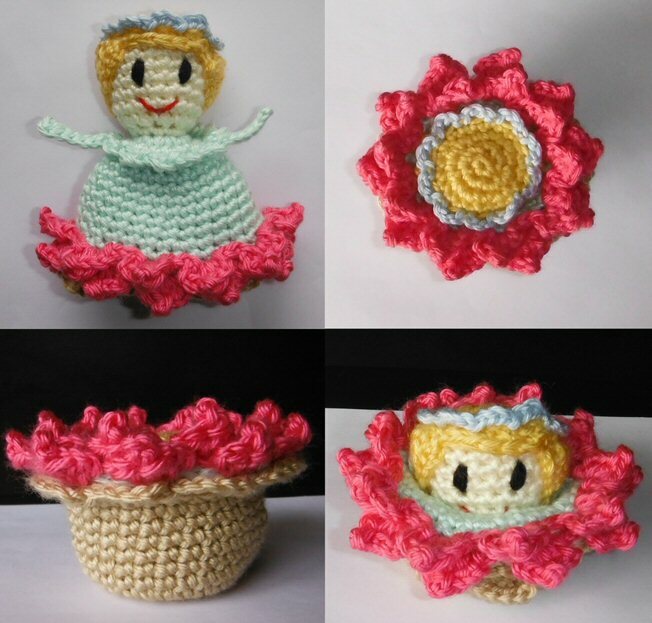 This little crocheted magical flower-child can transform into a beautiful flower basket. She would be a great Easter gift or maybe a bedside pal for someone who might be ill.
She folds easily into her basket and out again, and is easy to make. Gauge: 4 sc and 4 rows = ~ 1” (2.5 cm) Not crucial. 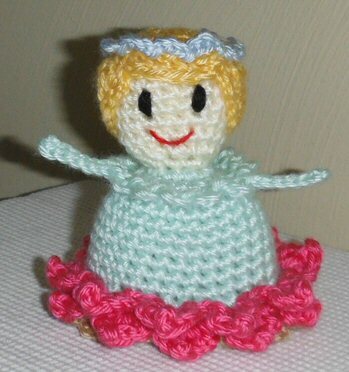 I used Caron Simply Soft in different colors. Red crochet cotton #10 or a thin sport wt yarn for mouth. Work in a spiral and mark beg sts. Do not join rnds or Ch-1, unless instructed. Use a thread or safety pin to mark stitches. Marked stitches are just to help with placement. Rnd 10: Dec around. (9) Stuff moderately: not too tight. Rnd 11: Dec, Sc in last 7 sts. (8) Change to dress color in last st. FO skin-color. Mark the Front Loop of the first stitch in Rnd 2. Rnd 12: This Rnd in BLO and Mark the first free-loop left-over from Rnd 11. *Note: The next stitch will be the beginning point of your first petal. With head closest to you, join Dress-color with a ss in the Marked st from Rnd 2. (Ch 3, skip next lp, ss in next lp) twice. and then ss in the same lp on the dress as the last ss. (Ch 3, skip next lp, ss in next lp) 6xs. With RT side facing and head down, attach Petal-Color with a ss in the next st after the last-joined-st of Rnd 12. Then Ss in the last 2 sts. At this point, jog up and Ss in the Marked first free-loop of Rnd 11.
from ** to ** around in the spiral of Rnd 11.
made on the bottom row. Total of 20 petals in 2 alternating rows. You can insert yarn-needle from back or top of head, and stitch through the head. 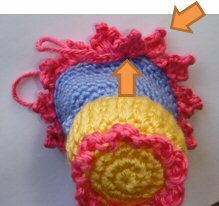 Sew the eyes and then bring yarn-needle to the back and tie the ends in place. The knot will be hidden by the Wig-cap. With Black yarn, I stitched the Eyes over Rnds 6 & 7 with about 4 sts between. I did vertical straight stitches with 3 strands for each eye. Add mouth over Rnd 9. I made single-strand straight stitches in the form of a “V” or a “U”. Rnd 1: With Hair-color: 6 Sc in a Magic Ring. Join with a ss in BLO of next st.
*Mark the top-front loop of the ss and the first free-loop left over from rnd 4. 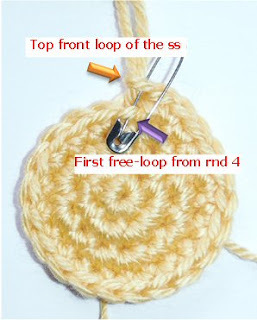 Put a safety pin through both loops. This is where the crown will begin. Rnd 5: This Rnd in BLO. Ch 1, Sc in same back-lp as the join-st and each around. Join to both lps of the first sc. (20) Continue with locks. 1: Ch 2, Ss in the 2nd ch from hook, and then Ss to next st on Rnd 5. 2: Ch 3, Skip the 1st ch, Ss in the next 2, and then Ss to next st on Rnd 5. 3: Ch 4, Skip the 1st ch, Ss in the next 3, and then Ss to next st on Rnd 5.
and then Ss to same st as last ss on Rnd 5. 5: Ch 6, Skip the 1st ch, Ss in the next 5, and then Ss to next st on Rnd 5. 6: Ch 6, Skip the 1st ch, Ss in the next 5, and then Ss to next st on Rnd 5. 7: Ch 6, Skip the 1st ch, Ss in the next 5, and then Ss to next st on Rnd 5. 9: Ch 6, Skip the 1st ch, Ss in the next 5, and then Ss to next st on Rnd 5. 10: Ch 6, Skip the 1st ch, Ss in the next 5, and then Ss to next st on Rnd 5. 11: Ch 6, Skip the 1st ch, Ss in the next 5, and then Ss to next st on Rnd 5. 13: Ch 6 Skip the 1st ch, Ss in the next 5, and then Ss to next st on Rnd 5. 14: Ch 6, Skip the 1st ch, Ss in the next 5, and then Ss to next st on Rnd 5. 15: Ch 5, Skip the 1st ch, Ss in the next 4, and then Ss to next st on Rnd 5. 17: Ch 3, Skip the 1st ch, Ss in the next 2, and then Ss to next st on Rnd 5. 18: Ch 2, Ss in the 2nd ch from hook, and then Ss to next st on Rnd 5. Do not FO. and will be positioned over the eyes. Ss to the bottom tip of each lock. FO with about 20” (50cm) to sew onto head. 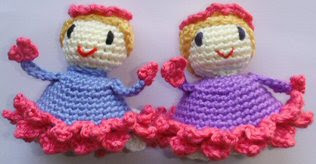 Join Petal-Color (or different color) with a Ss through both Marked sts from the Wig-Cap: the ss and free-lp from rnd 4. (Ch 3, Skip 1 st, Ss in next) around. (10-ch-3 lps) Join last loop to the same st as beg-join. FO. Pull the beginning and end yarns through to the underside of the wig-cap. Instead of weaving in, tie the yarn-ends. They will not show when the wig is in place. with the eyes under the 5 unused sts. Sew to head with yarn-end. 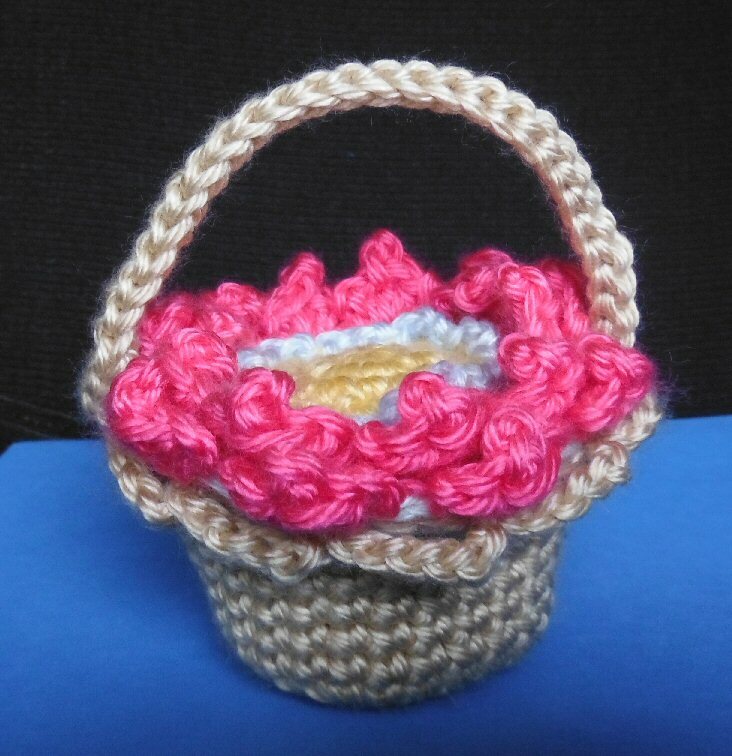 Rnd 1: Basket-color: 8 Sc in a Magic Ring. (8) Be sure to pull the yarn-tail to snugly close the ring. Rnd 13: Top edge of Basket: (Ss in the next st, Ch 6, Skip two sts) around. Assembly: Hold Dress and Basket together with wrong-sides facing. 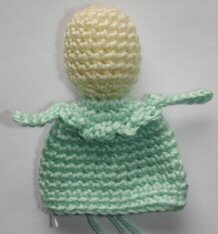 Basket-color: Sew together around the 16 free loops of the Basket and the Dress. Handle (Optional): Check where the arms (on dress) are, and position the handle to correspond. Join with a ss in the sc between the ch-6-lps. Ch 30 loosely. Be careful not to twist the chain. Skip 5 loops, join with a ss in the sc between 5th and 6th loop on other side. Turn. Join with a ss in the same sc between the beg ch-5 lps and FO. Or maybe a little chained necklace. Ch 4. Ss in the 4th ch from the hook. (Ch 4, ss in the same as the previous ss) 2 times. FO and sew to end of arms.